Score oneMORE A4 B&W caricature! Grab this oneMORE deal today and solve all your gift problems for the rest of the year! Once you've bought this caricature deal it does not expire. You can buy as many cartoons as you like, with as many people in them as you want. 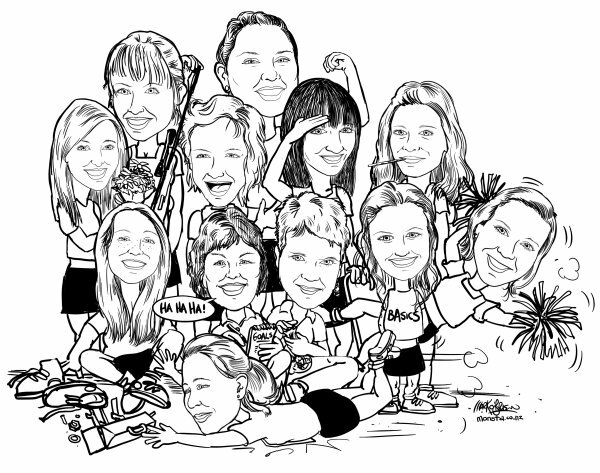 There's a button for up to six people... email me for a quote on larger groups, or for prices on colour caricatures. I'll email you a oneMORE voucher number for each caricature. When you're ready to order your new cartoons, just email me your photo/s, voucher number, and description of the scene you'd like. You'll receive a .jpg draft to approve by email, and the finished A4 cartoon by fastpost, within 7 days of your order. You'll receive a .jpg draft to approve by email, and the finished A4 cartoon by fastpost, within 7 days of your order.